A former mentor on MasterChef Australia is using a patented nanotechnology to create a range of chef jackets and aprons you'll never have to wash again. A start-up company in Australia is introducing a line of stain-proof jackets made with nanotechnology. Soon chefs can look forward to sweat-free uniforms that they'll rarely have to wash. The hydrophobic fabric is extremely water-resistant, which prevents stains from forming. The repelled liquid traps dirt particles, meaning the shirt cleans itself. Professional chef and co-founder of Fabricor Workwear, Adrian Li was frustrated with having to frequently wash and replace his uniform. The former MasterChef Australia mentor said: “As a chef I find it really difficult to keep my jacket white, and we like to keep our jackets white for obvious professional reasons. “There's nothing currently on the market that helps this apart from buying new jackets and washing them every day. The nanotechnology modifies the fabric at a molecular level by permanently attaching hydrophobic 'whiskers' to individual fibres. Any liquid spilled on the fabric just beads up and rolls off. As a result the uniforms last longer and seldom have to be washed, which should be at cooler temperatures. It's a win-win for customers, who save water, energy and money. Other products on the market employ a spray-application, which can destroy fabrics and contain carcinogenic chemicals. 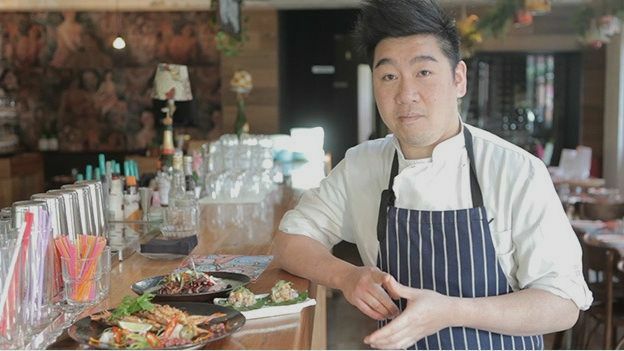 Li, who is currently the head chef at Saigon Sally in Windsor, said chefs waste time and money on poorly designed work wear that doesn't last. He plans to expand to the medical industry by making medical garbs, nurse's uniforms and lab coats. Fabricor Workwear is launching a campaign on Kickstarter today to raise funds and awareness for its venture. They need to raise $5,000 (£2,751) of capital for their first production run to meet minimum order quantities. The start-up expects to sell its work wear to the general public in February 2015.